ANNA Feature, 1996, 35 mm, colour, 120 min. Director Aloizs Brencs tells a story based on true events. Its the life story of Anna Notken, a Zistererzienser nun, who lived in Livland during the beginning of the Reformation at the end of the 16th century. 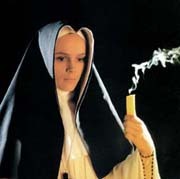 Her life and struggle for survival of the old Riga monastery St.Maria - Magdalena is the films principal accent. Its walls had given refuge to the poor and safety against marauding soldiers, hunger and death.